Over the years, since Photoshop first appeared on the scene, many unsuspecting photographers and photo retouchers have fallen prey to the evil known as the Brightness/Contrast command. Beginner Photoshop users looking to improve the overall appearance of their images headed up to the Image > Adjustments menu and were delighted to find a simple and seemingly straightforward little option called Brightness/Contrast. With a dialog box made up of only two sliders - one for brightness and one for contrast - what could be easier? Unfortunately, the only thing you could do quite easily with the Brightness/Contrast command was destroy your images. The reason had to do with how it worked. Sure, it could make your images brighter, but the problem was that it made everything in the image brighter. Those deep, dark tones that brought out detail in the shadows? Brighter. Areas that were already bright enough? Brighter. Photoshop took everything in the image and just made it brighter, and areas that were already bright were forced to pure white, which meant you lost all of your highlight detail. The same was true if you needed to darken an image. Photoshop would take everything in the image and make it darker, including areas that were already dark enough, which forced them to pure black and you'd lose your shadow detail. The Brightness/Contrast command affected everything in equal amounts, and the more brightening or darkening you applied, the worse things got. It may have been somewhat useful for creating special effects where image quality isn't always top priority, but for serious photo editing, the Brightness/Contrast command was about the worst "feature" ever found in Photoshop. That is, until Photoshop CS3 came along! With much better ways available to correct any tone or contrast problems in an image, like using Levels or Curves, and so many Photoshop instructors telling their students to avoid the Brightness/Contrast command like the plague, few people would have been surprised if Adobe had finally decided to retire the Brightness/Contrast command and remove it from Photoshop. But instead, they did something no one expected. They actually fixed the Brightness/Contrast command in Photoshop CS3! The Brightness slider now works much like the midtone slider in the Levels dialog box, allowing us to actually brighten an image without clipping the lightest or darkest areas to pure white or black, while the Contrast slider now acts much like the Curves command, lightening light areas and darkening dark areas again without clipping the highlights or shadows. 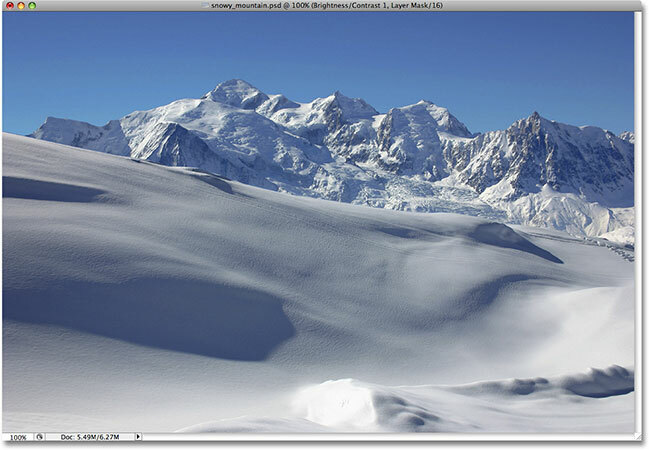 It's still not the most professional way to work, but for everyday images that simply need a quick boost in brightness or contrast, the improved Brightness/Contrast command in Photoshop CS3 may be all that you need! There's lots of good detail in the snow and in the mountains in the background, but the overall photo just isn't "popping" out at me the way I'd like. To find out what the problem might be, I'll take a look at my Histogram palette, which by default is grouped in with the Navigator and Info palettes. You can also select the Histogram palette from the Window menu if you don't see it anywhere on your screen. The Histogram palette showing the image information in the midtones. Click on the New Adjustment Layer icon and choose "Brightness/Contrast" from the list. Switch between the new and old versions of the Brightness/Contrast command with the "Use Legacy" option. Drag the Brightness slider towards the right to brighten the image, or drag to the left to darken it. The photo now appears brighter after increasing the Brightness value. The shadows have now been lightened along with everything else, decreasing overall image contrast. The histogram showing that every brightness value in the image has been lightened, clipping the highlights to pure white. Attempting to add more contrast to the image by dragging the Contrast slider towards the right. Increasing contrast with the old version of the Brightness/Contrast command has blown even more of the highlights to pure white. Well, we've definitely brought back quite a bit of contrast, but again at what cost? We've blown out even more of our highlights to pure white, with large areas of snow along the bottom of the photo as well as in the mountains having lost all detail. In fact, the snow along the bottom now appears to be glowing! At this point, the image just looks harsh. It's brighter than it was originally, but with so much detail now missing, it would be tough to call it an improvement. The histogram showing even more image information being clipped to pure white. Dragging the "old" Contrast slider all the way to the right. 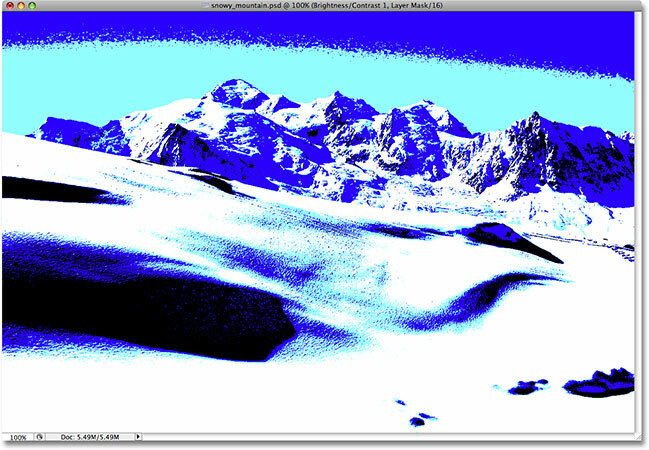 All that remains of the histogram after dragging the Contrast slider its maximum value. Little remains of the original image after dragging the Contrast slider all the way to the right. Don't try this at home. Of course, you may argue that I've taken things to a bit of an extreme here, and I may tend to agree with you, but it was done purely to show just how bad of a command Brightness/Command used to be. Thankfully (and quite surprisingly), all that has changed as of Photoshop CS3. Let's take a look at just how big of an improvement the new version really is! Leave the "Use Legacy" option unchecked for the new version of the Brightness/Contrast command. The original, unedited photo once again. The original shape of the histogram has returned. Dragging the Brightness slider towards the right to increase image brightness. The light areas in the photo have been brightened without lightening the darker areas. This time, the histogram shows no clipping in the highlights even though the brightness level was increased even further. It is still possible to clip highlights if you drag the Brightness slider too far to the right (or clip shadows by dragging too far to the left if you're darkening the image), so you'll definitely want to keep an eye on your Histogram palette as you work, but the new version of the Brightness/Contrast command gives us a much larger range of movement with the slider before we run into any problems. In fact, while the old version of the Brightness slider only went as high as +100 (or as low as -100), the new version goes all the way up to +150 (or down to -150). Thanks to the new version of the Brightness/Contrast command, the contrast has been increased without clipping any shadows or highlights. The Brightness/Contrast command in Photoshop CS3 was able to improve the tone and contrast without losing any highlight or shadow detail. Increasing the Contrast command to its maximum. Even at the highest contrast value, only minor highlight clipping has occurred. A much different result than before. As I mentioned at the beginning, even with its major improvements, the Brightness/Contrast command still isn't the most professional way to improve tone and contrast in a photo. For important images, you'll want to stick with Levels or Curves to get things right. But if all you need is a quick, no hassle way to brighten or boost the contrast of an image and you have a copy of Photoshop CS3 or higher, just add a Brightness/Contrast adjustment layer, make sure the Use Legacy option is unchecked, and drag the Brightness and Contrast sliders as needed (while keeping an eye on the Histogram palette of course). After years of destroying images, the Brightness/Contrast command in Photoshop finally works the way you'd expect, and it doesn't get much easier than this. And there we have it! Check out our Photo Retouching section for more Photoshop image editing tutorials!